Open offices increase disruption, stress out employees, and don’t deliver on their promises. At least, that seems to be the opinion of anyone writing an editorial on the open office nowadays. As the Community + Content Manager for ShareDesk, I work to keep my finger on the pulse of all things coworking. There’s one kind of article I seem to find on many sites I visit. Everyone talks about how the open office is harming our modern-day workforce. From The New Yorker to The Washington Post, Forbes to The Huffington Post, it’s a popular subject. But these diatribes only tell part of the story. 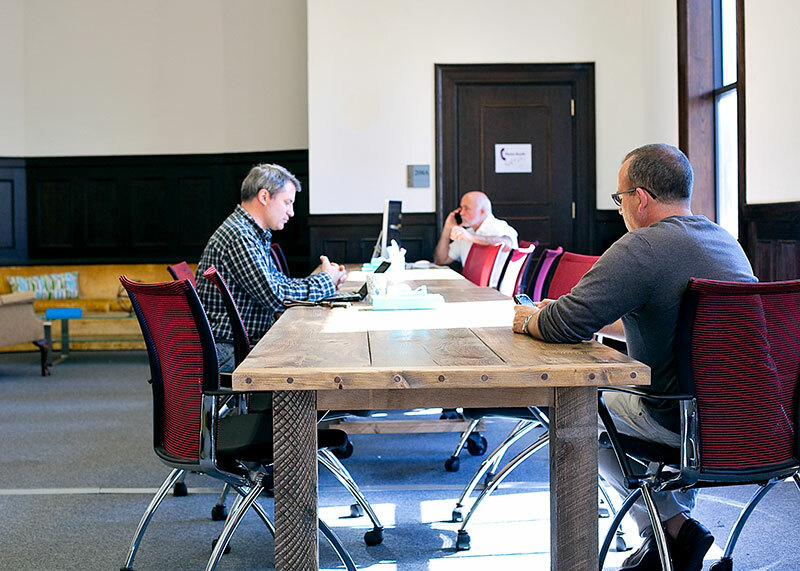 B:Hive Bridgeport, ShareDesk venue partner. 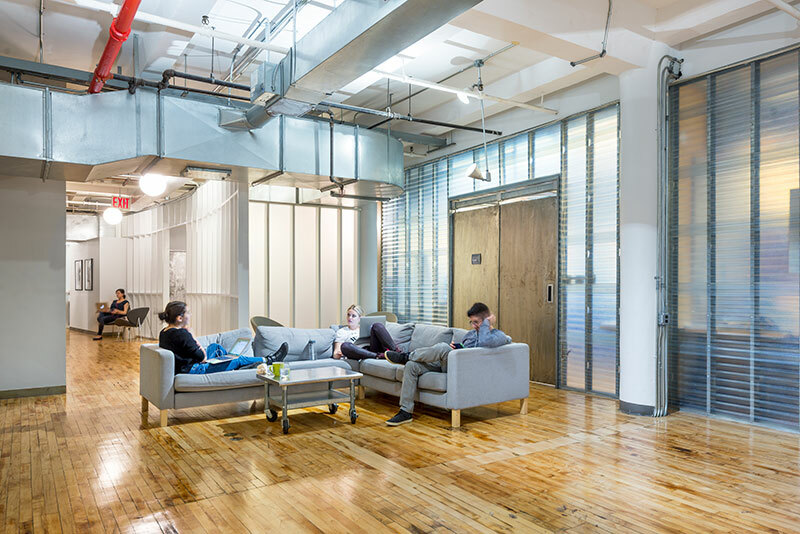 A whopping 70% of American employees work out of offices with an open floor plan, according to the IFMA. When any trend becomes as widespread as open offices, you’re bound to find naysayers. So what’s the disconnect here? Why do we keep cycling back and forth? We create enclosed spaces, then we tear them down. We build walls and then grow to resent them. We’re always searching for new ways to keep our workforce happy and efficient. Instead of continuing to blame our surroundings for our decreased morale and productivity, how can we improve our day-to-day without dramatically altering our surroundings? 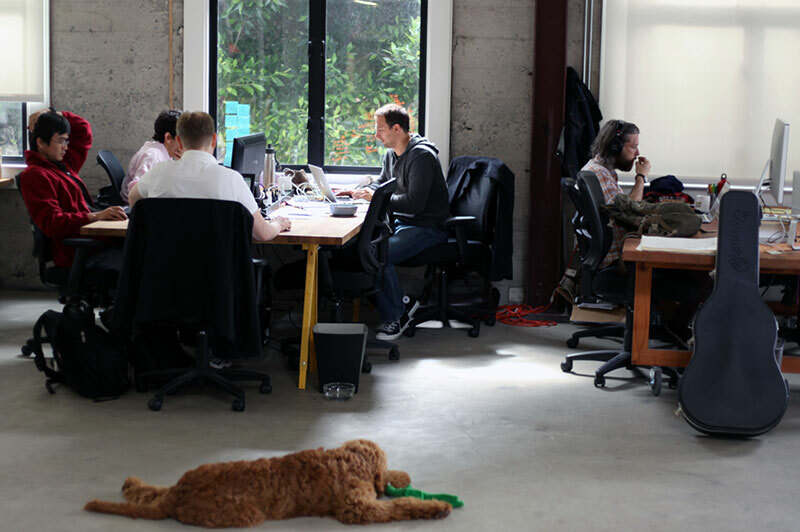 1776 SF, ShareDesk venue partner. My interest in this topic came from a conversation I had in May for ShareDesk’s Future of Work series. I spoke with Lisa Whited, the founder of WTF (Workplace Transformation Facilitation). This got me thinking about the many reasons people feel unproductive in open offices. It’s easy to sit back and complain, but it’s more productive to take action and make changes. Kolektif House Sanayi, ShareDesk venue partner. What follows are 3 distinct, yet related lists that look at different components that contribute to productivity: architecture of the space, interacting with others, and personal. If you invest in one new feature for your office, Lisa Whited recommends NRC ceiling tiles. NRC stands for noise reduction coefficient, and you’re looking for a rate of .85 and higher. This will keep sound from bouncing off all the hard surfaces you often find in modern open offices. You may be familiar with white noise. Pink noise is similar, but it helps mask both mechanical noises and the human voice. Pink noise transforms words from nearby conversations into muffled background chatter. This keeps you from listening to nearby conversations that don’t concern you. To better understand the concept of pink noise, listen to this short NPR feature. Interested in giving pink noise a try at your desk? Check out Noisli. The illusion of privacy means louder conversations—and more noise pollution. The higher the dividers between desks or adjacent spaces, the louder the conversations. Partially-enclosed spaces don’t make great meeting rooms for the same reason. If we can’t see other people, it’s easy to forget that we’re being noisy and disrupting others. Large monitors and ergonomic computer stands can create partitions. This cuts our ability to lock eyes with those around us and can make us forget how close our deskmates are. TechSpace NYC, ShareDesk venue partner. Many organizations forget that the most important factor to consider is behavior. 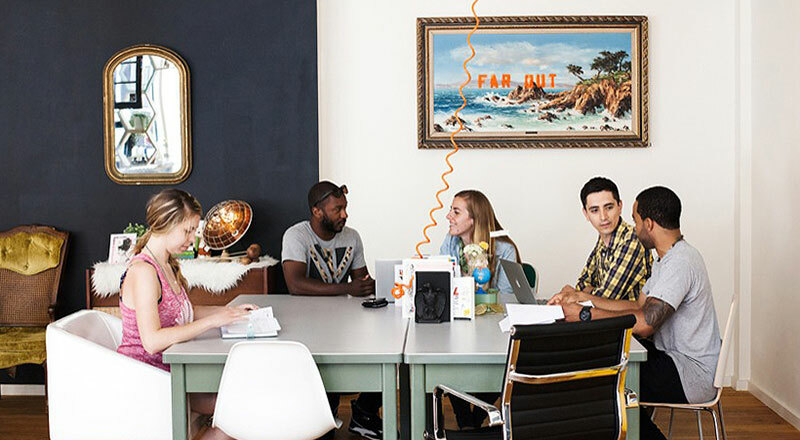 Create ground rules for how employees should work together within a space. Involve the employees in this process for added impact. For example, say 2 employees engage in conversation at someone’s desk. After 2 minutes, move the conversation into another area to avoid distracting your coworkers. Create some guidelines and write them down. It’ll become immediately easier for everyone to hold each other accountable. Instead of staying silent and frustrated, everyone feels empowered to speak up for themselves. This cuts down on passive-aggressive tendencies and resentment. It also helps employees feel comfortable reminding their superiors when they’re out of alignment. Everyone will be happier and will feel more comfortable communicating their needs. Open offices generally rely on meeting rooms. Enclosed spaces allow employees to hold conversations without distracting others. Meetings are a dreaded occurrence in offices—it’s easy for a meeting to drag on, which leaves people feeling like their time has been wasted. Open offices often have limited meeting rooms. This means that fast, efficient meetings become less of a luxury and more of a necessity. Work to develop a more efficient meeting strategy and everyone wins. For some great insights on how to improve meetings, read this article by Brian Tracy. Emails, desk visits, and other disruptions kill momentum and productivity. According to Fast Company, interruptions cost workers 40%-60% of their most productive time. That’s 3-5 hours every day. Team communication tools like Slack end the need for interoffice emails. It helps keep everyone more organized and encourages shorter bursts of communication. Some teams even use Slack to replace the old system of walking over to a colleague’s desk. Instead, they send a quick message that their coworker can respond to when they find a natural pause. Asana and Trello are great for project-based teams. These tools keep everyone clear on tasks and their due dates, cutting down on time spent in meetings. 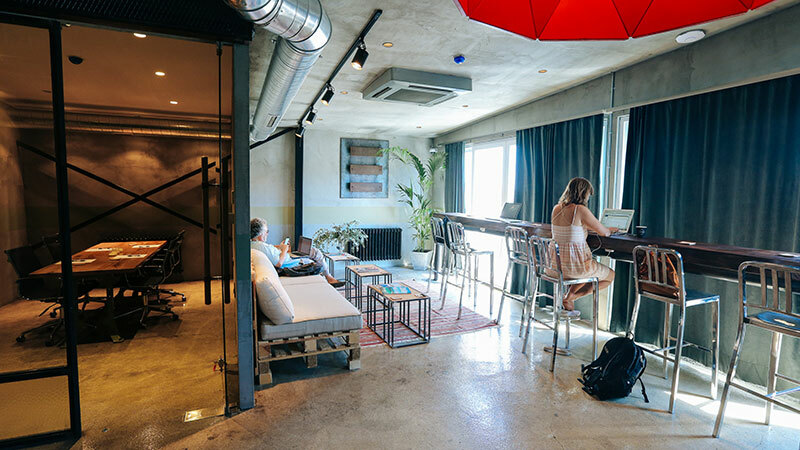 The Brew at Shoreditch Stables, ShareDesk venue partner. Everyone suffers mid-week slumps in productivity. If you crave variation in your work week, I’ve got 2 options for you. On days when you’re feeling depleted, a minimum viable day can help you hit the refresh button. Scaling back on your to-dos can keep your momentum going without causing a burn out. Some days we’re highly productive and some days we leave work feeling like nothing got done. Meet yourself where you are and listen to your needs. Intentionally beginning a day with a lean to-do list can be a mental reset so you can finish your week strong. For the days when you’re too bogged down in distractions, consider taking an airplane day. Many find airplanes to be the most productive work environments. Flying limits your distractions. You have no internet access, no phone calls, no meetings, and no coworkers popping by your desk. Try mimicking this environment in your home office from time to time to get some serious work done. Try airplane days as as a regular part of your week or as a technique to try when big deadlines are looming. If you don’t feel comfortable turning off your phone, at least use do not disturb mode. Program in a few numbers for only your unmissable calls (your spouse, your boss, etc.). This way, you’re at least cutting out the majority of interruptions. We’ve all felt it: multi-tasking can make you feel like a superhero. Unfortunately, research proves what we’ve feared to be true all along: Multi-tasking has a negative impact on performance. Why does this continue to be such a bitter pill for us multi-tasking enthusiasts to swallow? It’s because our brain is lying to us. Bouncing between many activities or tasks feels so fulfilling, yet it’s not because we’re actually getting more done. Multi-tasking is so addictive because it makes our work feel more emotionally satisfying. This in turn creates a positive feedback loop in our brain, forming addiction. In fact, the name “multi-tasking” is a fallacy. We’re actually just task switching, as we can’t complete 2 tasks simultaneously. Seconds lost switching from task to task can add up, stealing a whopping 40% of our productivity in a day. Stamford Innovation Center, ShareDesk venue partner. It’s natural to externalize blame for our own frustrations. Ironically, one of the simplest productivity hacks is the hardest: Accept personal responsibility. Having personal responsibility means many things. Stop blaming other people/situations for your own unhappiness. Learn your own personal boundaries (and enforce them). Most importantly, ask for what you need to be successful. If you’re feeling sick, don’t come into work. Ask your boss about opportunities to be more locationally-flexible if it’ll help your mood. If you’re bogged down in work, don’t attend a meeting if you’ll just sit there stewing in a silent rage. We teach others how to treat us. If we don’t set our own boundaries, others will walk all over us without even knowing they’re doing it. Vocalize your frustrations. Otherwise, you have no rational basis for getting angry or passive aggressive about them. Simple as that. The open-office concept is an imperfect system, but in that way it’s like every other office design. It’s better for some individuals, teams, and companies than others. The amazing benefits of the open office—such as collaboration and community—are worth fighting for. The layout of the space isn’t the problem. Lack of personal responsibility is a major, underrated thief of workplace productivity. With a few tweaks, all teams should find a way to make the open-office concept work for them. 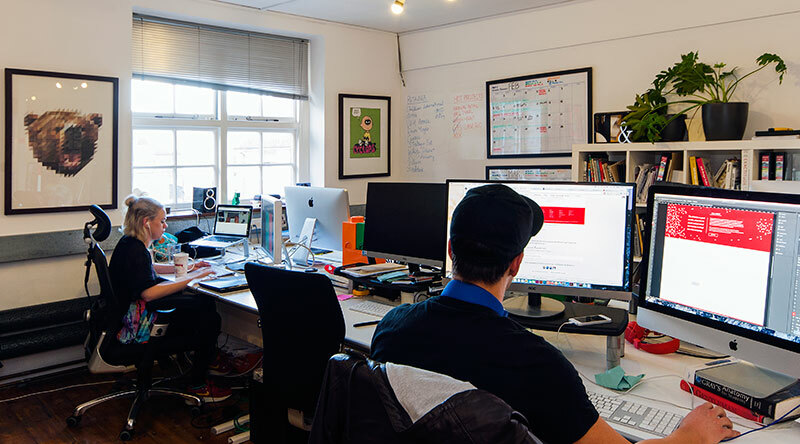 Header image: The Brew at Victoria House, ShareDesk venue partner. Mara Savina Falstein is the Community + Content Manager for ShareDesk, the largest platform for flexible workplaces with a network of over 5,000 locations spread across 40 countries. She passionately explores the coworking movement, sharing the stories and voices of ShareDesk's diverse global community on the ShareDesk blog. You can reach her at social@sharedesk.net.